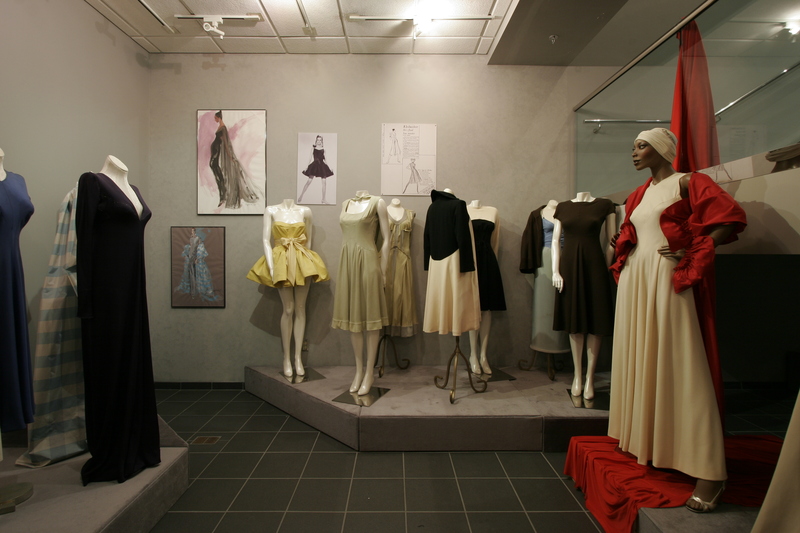 Architecture versus fluidity in the artistic creation of fashion is the theme of the new exhibition that opened on January 22, 2005, at the Historic Costume & Textiles Collection located in the College of Human Ecology at The Ohio State University. Co-sponsored by the Columbus Museum of Art and supported by a grant from the Ohio Arts Council, Sculpture and Drapery: The Art of Fashion displays rare works by the designers Charles James and Charles Kleibacker, whose artistic visions led them to use the same medium, fabric, in different processes to create contrasting works of art. Charles James (1906-1978), who worked in New York, London, and Paris, is remembered for his timeless, sculpted fashion designs that were as much architectural wonders as garments. James’ dresses are of elegant fabrics molded on an armature of underpinnings, including horsehair canvas, horsehair braid, nonwoven interfacing, and boning. These intricate layers pad and stiffen James dresses until they almost assume a life of their own. In contrast, Charles Kleibacker (1921- ), who worked in New York and Paris, produces designs in which drape and fluidity of fabric offer elegance while enhancing the female form and affording comfort. Known as the “master of the bias,” Kleibacker later became Designer-in-Residence with the Historic Costume & Textiles Collection at the College of Human Ecology. Still active in the world of textiles, clothing, and fashion design, Kleibacker is adjunct curator of design for the Columbus Museum of Art. Compared to James’ garments, Kleibacker’s garments never rely on underpinnings to mold them into desired shapes. Instead, he employs the female form as the armature for his creations, draping them with bias-cut fabric as the essence of his art. Sculpture and Drapery is open to the public at no charge on Wednesdays, Fridays, and Saturdays from 11:30am to 4pm, or Thursdays from 11:30am to 7pm at the College of Human Ecology, The Ohio State University, Campbell Hall, Geraldine Schottenstein Wing, 1787 Neil Ave., Columbus, Ohio 43210, (614) 292-3090, strege.2@osu.edu. Call in advance for tours of 10 or more people. The Sculpture and Drapery exhibition is organized on two floors of the Snowden Gallery in the Geraldine Schottenstein Wing, with Charles James’ works on one floor and Charles Kleibacker’s on the other. The Charles Kleibacker portion of the exhibition is divided into four sections. Four-ply silk crepe, used by Kleibacker in the 1960s to create a series of short evening dresses, is hardly available today in the weight and quality of earlier times. The fabric of these exhibition garments was made by Bianchini-Ferrier, who, as one of the great French manufacturers of high-end fabrics for the couture industry, was among its earliest producers. Hanging on the wall by this portion of the exhibition is an enlargement of a full-page advertisement that appeared in Harpers Bazaar when two of Kleibacker’s dresses were chosen by Bergdorf Goodman for sale in all its stores. A black, four-ply silk crepe cocktail dress epitomizes the Kleibacker concept of using the natural fluidity of bias-cut fabric to bring out the best in the female form while playing down any figure flaws. The front bodice of the dress is gathered around a plastron, a shape reminiscent of a medieval armor breastplate. Much of the rich silk skirt falls in liquid folds from the bottom of the plastron, which reaches just below the waist. The round neckline and long, fitted bias-cut sleeves provide overall coverage, yet a cutaway exposes the graceful curve of the upper shoulder, a part of the anatomy that is lovely on women of all ages. The snug sleeve construction covers any underarm figure flaws while directing attention to the slender form of the wrist. Two narrow spaghetti straps tie the sleeves to the dress with standup bows at the top. These bias-cut mini-straps, so narrow as to earn the name “angel hair” straps, are a signature Kleibacker embellishment used on many of his gowns. This elegant dress, like all Kleibacker designs, remains the essence of style and comfort 45 years after its creation. He learned early the importance of creating timeless samples from which he could derive multiple garments, each with variations for different clients. This approach made sense because he was designing for women who, whether Bergdorf Goodman clients or his private clients, were not discarding clothes each season. They wanted to keep his garments, especially if they could mix and match pieces acquired over time. He learned to focus his creative time on developing a select number of versatile, well-conceived designs that would flatter many figures and could be varied endlessly. 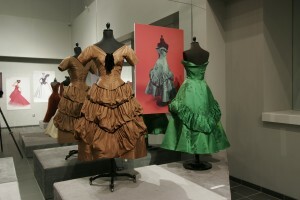 The platform displays examples of two of Kleibacker’s muslin dress samples that were among his best-selling designs. The multiple dresses and gowns derived from these samples each look totally different from the other due to different fabrics and colors and variations in necklines, closures, sleeves, and more. One of the basic dresses has a yoke neckline that closes in back with self-covered buttons and loops. Kleibacker used this yoke to create the cape for a striking Chinese red and pink ensemble for DuPont in the mid-1960s. The company was preparing to launch its new silk-like fabric, Qiana, in the late 1960s and asked Kleibacker to create several designs in great secrecy for its advertising campaign. For the floor length, bias-cut Chinese red cape, Kleibacker reversed the neck yoke from the basic muslin design, turning it around so it opened in front. The cape fastens with a row of bound button holes, each closing with two self-covered buttons. The floor length, bias-cut skirt of Chinese red has four gores but no side seams. Instead, release pleats accommodate the hips and accentuate drape. The soft pink, wrap-around blouse has a V-neck, Kleibacker’s signature angel hair straps, and a gracefully draped side tie. A bias-cut length of red fabric can be used as a head wrap, a hair band, or other accessory. 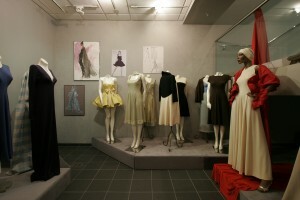 A selection of wool crepe dresses on display were created during the height of Kleibacker’s design career from 1960 to 1986. Two garments, displayed inside out, reveal Kleibacker’s quality construction techniques that rely on creative seaming to generate ease and fullness that molds to the figure as desired. A white, full length, sleeveless evening dress from the late 1970s is underlined with white silk shantung, primarily due to the opacity of the white fabric. The lining acts as one piece with the white wool. The fabric molds to the torso using creative vertical and diagonal seaming instead of bust and waist darts. The A-line skirt has no side seams but, like the Qiana skirt, features release pleats to accommodate the hip. A keyhole ornaments the back above a hand-applied zipper, and the hem and inside seams feature hand overcasting. The intricately constructed dress is complemented by a bright red, bias-cut stole of silk taffeta, which contrasts dramatically with the white. The simple length of fabric is edged at each end with a gathered ruffle, making it easy to construct yet elegant to drape over bare shoulders when going out. A full length black silk crepe evening dress with lace sleeves has a cutout back that is discretely covered with black lace. It creates drama and hints at bare flesh without actual exposure. Mrs. Richard Nixon was taken with this design when she was First Lady and asked Kleibacker to make it for her to wear to a 1971/72 White House event. At her special request, he produced it for her in an old rose color since she did not like to wear black at the White House. Another show-stopping outfit, a black skirt and bandeau of Qiana fabric, features today’s in-look of a bare midriff and a hip-hugging skirt, despite the fact that the skirt was created in 1969 and the bandeau top in 1981. The backless top is the same bias-cut accessory that served as a head wrap or hair ornament with the red and pink caped Qiana ensemble. The bandeau snakes across the bust line, up around the back of the shoulders, and around the front of the neck. The black silk braid waistband of the skirt begins at the hips. A sand-colored silk yoke hangs from the braid, from which the skirt is suspended by another circle of tightly gathered silk braid. A short zipper at each hip ensures easy access and a snug fit. The Kleibacker portion of the exhibition includes four framed illustrations by the famous fashion illustrator Steven Stipelman, who was known for his illustrations on the covers of Women’s Wear Daily. The illustrations hang near each of the four gowns that they capture on paper or canvas. Charles James also used draped fabric in his creations, but he relied on millinery techniques to create an armature or structure over which the fabric lies. This method of creating dresses contrasts markedly to Charles Kleibacker’s use of the female form as the underlying armature for bias-draped fabric. The exhibition features seven garments by James, all of which are a specialty of his–evening wear. Enlarged photos of seven more James dresses will be featured as well. Charles James began designing in the 1920s and was in his sculptural heyday during the 1950s. One of his most famous clients was Mrs. Austine Hearst, the wife of William Randolph Hearst, Jr. Mrs. Hearst was Charles James’ favorite model, and he made several gowns for her. One of them, the “Four-Leaf Clover” gown that is in the exhibition, was considered by James to represent the culmination of his career. Marguery Bolhagen, a Washington, D.C., dressmaker, also designed dresses for Mrs. Hearst in the long-waisted and ‘hard’ sculptural fashion Mrs. Hearst preferred. Four garments in the exhibition were given to the Collection by Mrs. Bolhagen, one of which is a James, two of which are Bolhagen designs, and the last, a combination by the two designers. The first of the Bolhagen designs is a short cocktail dress of heavy brown silk ottoman. The fabric has a wonderful ribbed effect thanks to float yarns that create distinctive stripes. The long tight bodice is fitted to the body using an inner bodice that looks like a long-line bra. It is further lined and stiffened to give it structure. The pattern pieces of the bodice come together in an intersection of four seams under the bust, and five seams just above the skirt. The complexity of this construction is extraordinary. The pieces of the full skirt are joined to present the striped effect at different angles. A little capelet, a style that has resurfaced in 2005, made of the same matching ribbed silk, tops off the design. The second dress donated to the collection by Marguery Bolhagen, also worn by Mrs. Hearst, is a tawny brown velvet evening gown with a Liberty bell-shaped skirt. Weighing 15 pounds, it is so stiff and smoothly fitted, it can literally stand alone. The body-hugging bodice grips the tiny waist, reveals a generous swath of cleavage, and stands away from the body at the shoulder where straps curve up but never meet the back, instead ending in graceful points. The attached underbodice zips up the back, and the dress zips closed over it. The skirt acquires its Liberty-bell shape from hoops held in place by horsehair canvas and four-inch wide ribbons of horsehair braid stitched down to create a solid structure. A waltz length ball gown with a gunmetal gray silk taffeta bodice and yellow tulle skirt is the combination James/Bolhagen design. It features a tight strapless James bodice using creative, nontraditional seaming to mold it tightly to the form. A shawl collar, attached in front but unattached in back, with a twist, creates a combination cap sleeve/off-the-shoulder effect. The skirt is the Bolhagen contribution. It is three layers of yellow tulle and white bobbinette over yellow faille flatlined with stiff white nylon that looks like window screening. The overall effect, as for many James’ dresses, is light and ethereal, yet the gown is solid and well constructed. Mrs. Bolhagen’s daughter wore it to her high school prom in 1960. During this time, James named some of his dresses, and the variation of the“Pouff” dress in a vivid kelly green jacquard silk is a prime example. The strapless bodice of this waltz-length ball gown features an architectural addition like the winged collar on a man’s tuxedo shirt. The skirt, built on bobbinette stitched to horsehair canvas with boning, is ornamented with a wide band of matching fabric gathered in a three-dimensional serpentine pouff that encircles the skirt. A pearl sits at the top of each gather of the pouff, and big box pleats flare out at the hem. Of all dresses that James named, the “Four-Leaf Clover” gown is probably the most famous. Kleibacker points out that it’s particularly significant that the Historic Costume & Textiles Collection at Ohio State owns James’ first version of this dress created for Mrs. William Randolph Hearst, Jr., to wear to the Eisenhower Inaugural Ball in 1953. James considered this long, strapless white dress, ornamented by a wide band of black velvet around the skirt, to be his masterpiece. The clover leaf name comes from the shape of the skirt that, when the circumference of the hemline is diagrammed, resembles a four-leaf clover without a stem. It keeps its shape thanks to three distinct layers of boning, stiffening, and underlining. Suspended from the fitted waist, the skirt sways and undulates in a most graceful manner as the wearer moves. According to Anne Coleman in The Genius of Charles James, Mrs. Hearst also wore this dramatic gown to the Coronation Ball of Queen Elizabeth II and a similar function at the Palace of Versailles. Written by Janet Ciccone, director of Communications, College of Human Ecology, The Ohio State University, 1787 Neil Ave., Columbus, OH 43210, e-mail: ciccone.2@osu.edu.